WaveVR_Beam.cs simulates a laser pointer for the controller to help the user choose an object. Click to show beam or not, default is true. Will show beam when device is connected, and hide beam when device is disconnected, default is false. If this option is checked, beam length and color is defined by system config. default is checked. The beam will update every frame if checked. default is false. Beam will show ahead of controller model, default is 0.015f. Beam width of start side, default is 0.000625f. Beam length, default is 0.65f. Beam width of end side, default is 0.00125f. 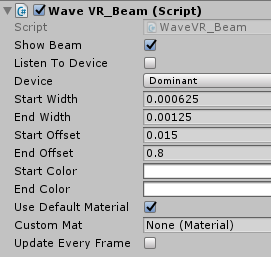 The beam will use material provided by WaveVR SDK. default is checked and choose start/end color. Beam color of start side, default is 0xFFFFFFFF. Beam color of end side, default is 0xFFFFFFFF. If Use default material isn’t checked, developer will select Custom material and beam will apply this material. Developer is able to use it to design your preferred beam style.